First things first. You want to start with a ripe avocado. Most of the time, the avocados you find at the store will need a few days to ripen. 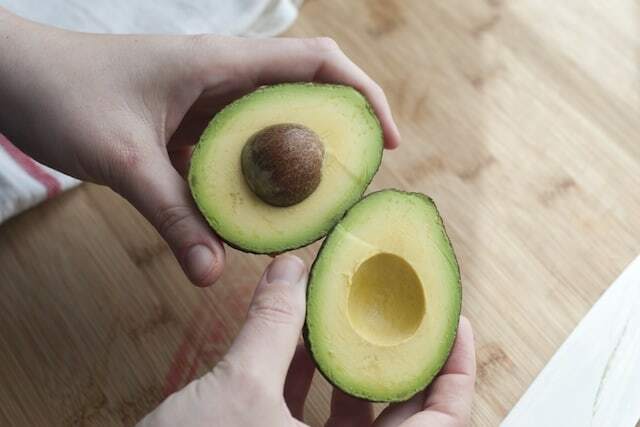 You’ll know when an avocado is ripe when it gives just slightly when squeezed. 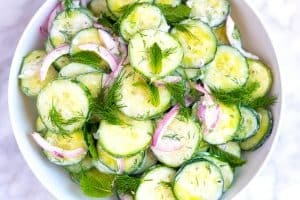 If unripe, don’t store them in the fridge. You want to keep them at room temperature until ripe. 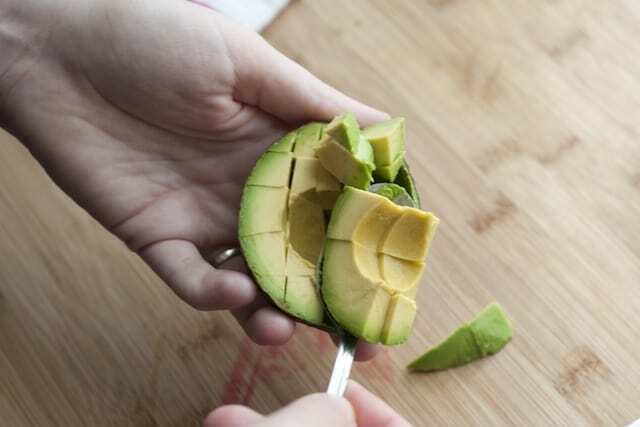 When it’s go time, cut the avocado in half lengthwise around the seed. 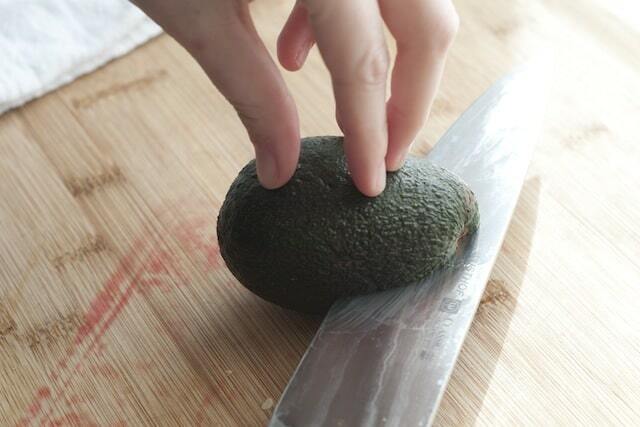 Make sure you have control over the avocado and be sure you know where those fingers are! Once cut, twist and separate the two halves. Hello mister (or misses avocado)! 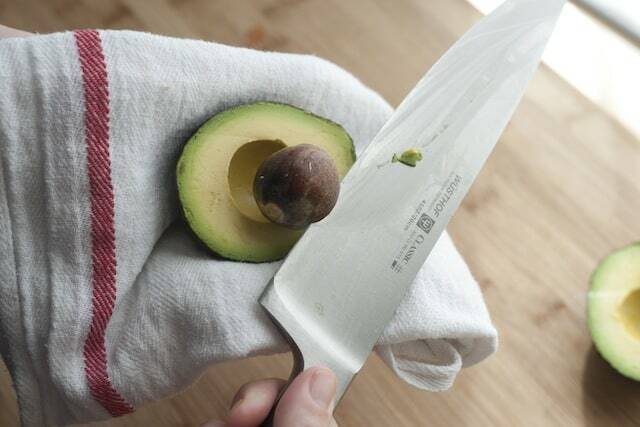 To remove the seed, fold a kitchen towel then use that to securely hold the avocado half with seed. Then, gently tap a chef’s knife into the seed. You will need some force here, but don’t whack it. Then twist a little and remove the seed. Go for the wider section of the knife, don’t use the tip. If the previous method isn’t your cup of tea, just use a spoon. You may loose a bit of flesh, but do whatever you feel more comfortable with. It’s your avocado! 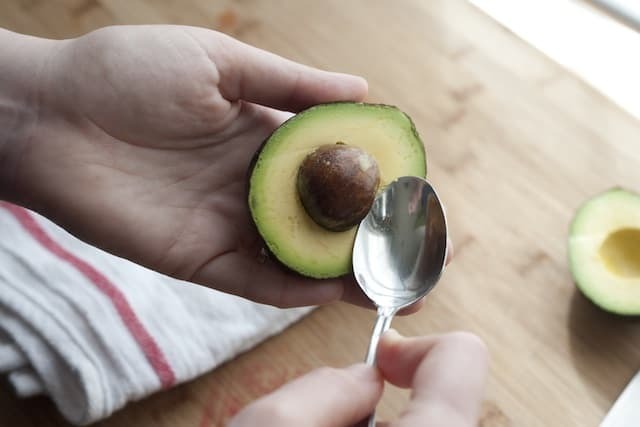 At this point, you could use a spoon to scoop out all of the flesh, or if you want slices, use a knife to slice through the avocado flesh without cutting through the outer skin. You could slice the other way for cubes, too. Then, use a spoon to scoop out the cut pieces. Let’s say you have half an avocado left. 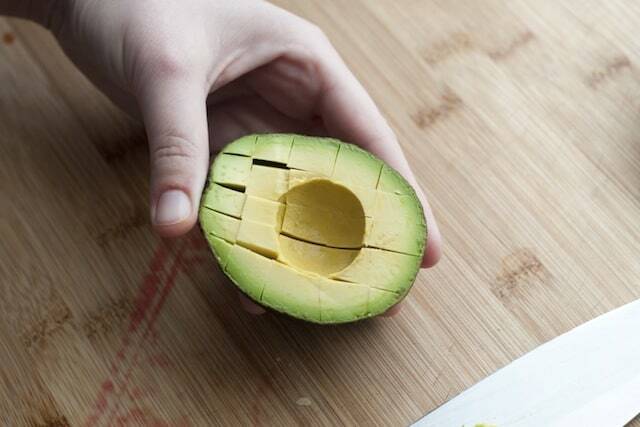 We admit, this rarely happens for us avocado lovers, but we might as well be prepared. The basic idea is to prevent oxygen from getting in, since oxygen will cause any cut flesh to brown. One option is to use a little acid. 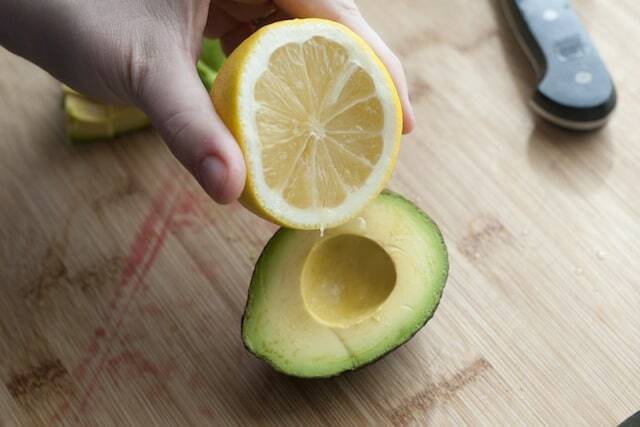 Just sprinkle a bit of lemon or lime juice over the cut areas of the avocado. You don’t need a lot… a spritz or two will do it. 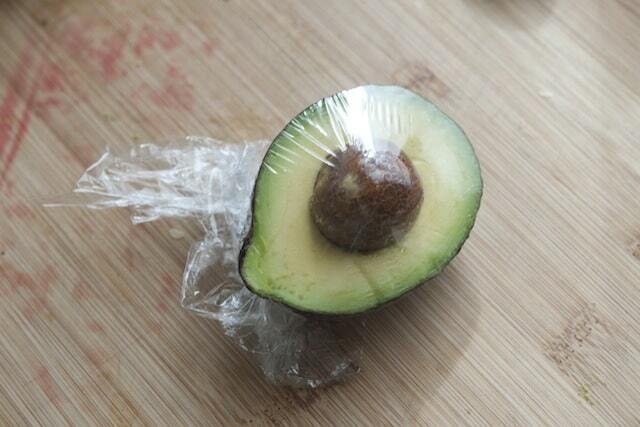 Then, wrap tightly with plastic wrap and store in the fridge. The avocado should stay green for a day or two. Another option is to leave the seed in. We don’t know all the specifics, but have tried and hey, it worked! So, just leave the seed in and wrap with plastic wrap. That’s it. 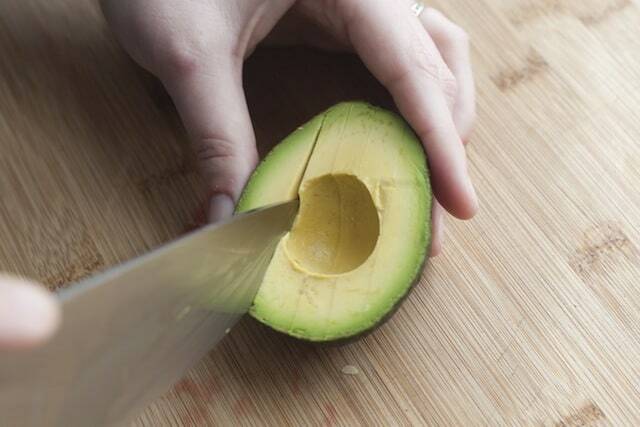 Do you have any tricks for cutting or storing avocados? How about how to use them… Guacamole, anyone? I look forward to receiving your newsletter of recipes. I freeze the avocado. Scoop out of skin and put in a baggie. We use them for breakfast shakes every morning. The avocados freeze well and retain their color. I use a Foodsaver on my avocados there good for a week or so when vacuum sealed. I have a dwarf Avocado tree, it’s is full blossoms at this time. I hope the spring storms and wind don’t knock them off. The plastic wrap you show are how I store mine. In a San Diego restaurant the waiter came with two table knifes and cut across the avocado one way and then another way. I prefer my guacamole lumpy and not smooth. 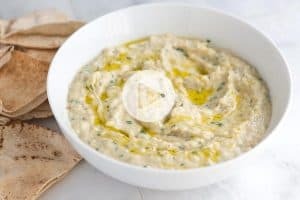 Cover your bowl and press the plastic wrap until it press’s against guacamole with pit in bowl add a little lime or lemon juice so it won’t turn black.. This is great! I love avocado! I will definitely give it a try. I’ve attempted everything to keep avocado fresh including submerging it in water (ya-didn’t work!). 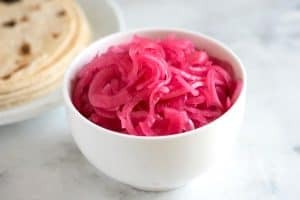 Onion! 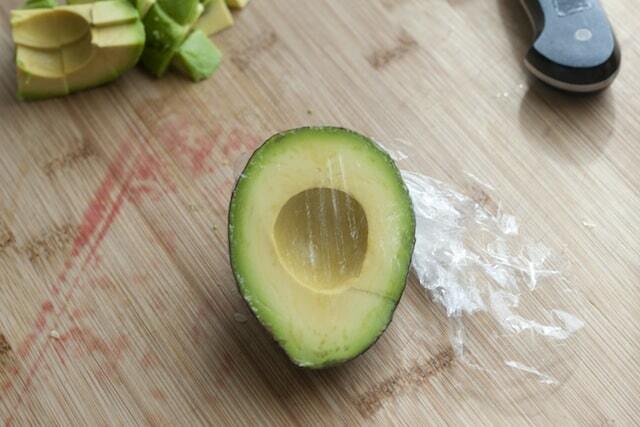 Store your avocado with an onion – it works better than anything I’ve ever tried! 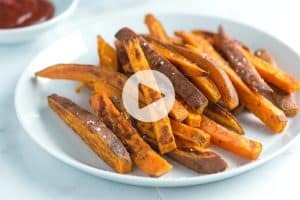 we’ve heard of this, does the avocado smell/taste like onion at all?